Sprayfoam is a good insulating material to mould to the curved structure of a traditional houseboat, but unfortunately the foam began “off-gassing” a number of Volatile Organic Compounds (VOCs) as it reacted with the air. 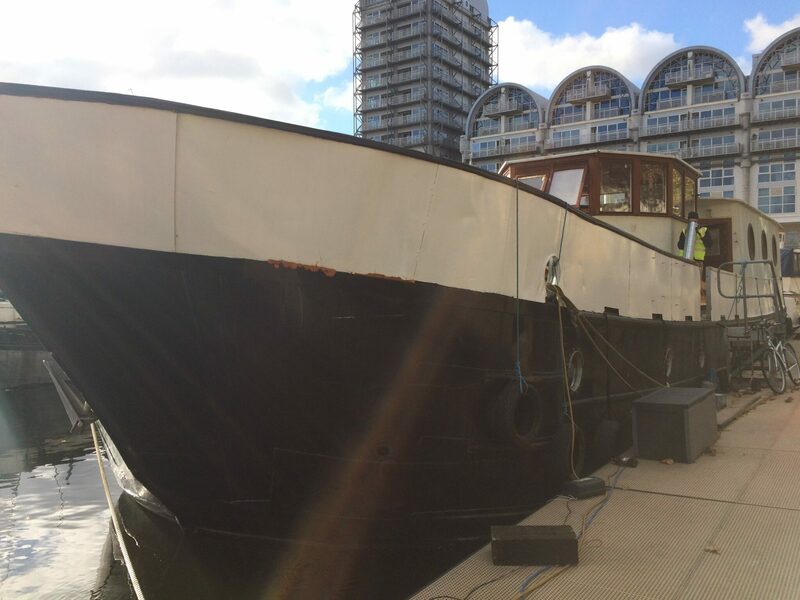 High levels of VOCs can cause sickness and discomfort, and the effects of these VOCs was exacerbated by the incredibly-high airtightness level of the boat at 0.2 Air-Changes per Hour (ACH) at 50pa. The houseboat is three times more airtight than most Passive Houses! These potentially dangerous VOCs tended to become particularly concentrated in the study room and the third bedroom, which did not have any natural ventilation from windows or draughts. A low energy active mechanical ventilation with heat recovery solution was required to move the air and clear it of VOCs, and the situation was urgent. With winter approaching the homeowners were having to keep their windows and doors open daily in an attempt to clear the air of VOCs, which was proving more and more uncomfortable as the temperature in London dropped. “We were desperate to get the system installed as quickly as possible; from first contact to design, installation and commissioning took about 8 weeks. Zehnder’s new ComfoAir Q600, with a 96 percent heat exchanger recovery rate, was chosen for this project as extremely high airflow rates were required to clear the boat of VOCs daily (551m3/hr of airflow in standard speed). 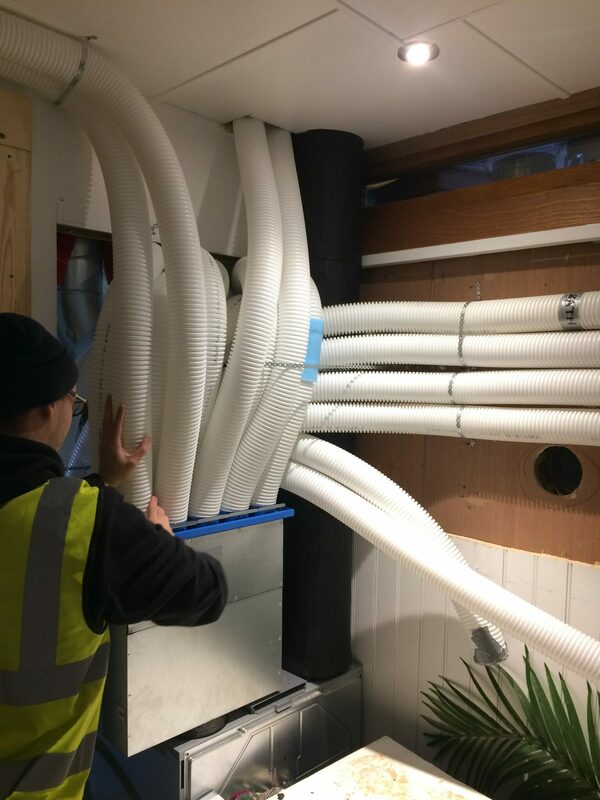 These high flowrates, plus the difficulties in retrofitting an MVHR system into a houseboat, meant that there were particular challenges to overcome in designing the MVHR ductwork system for the houseboat. 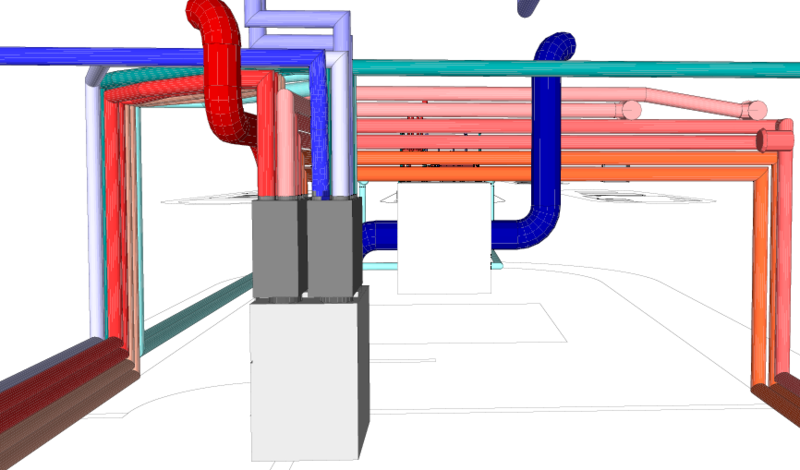 Zehnder asked Enhabit to handle MVHR design, install and commissioning. Enhabit has strict parameters on acoustics, pressure drops and energy performance when designing any MVHR system, as we want the MVHR system to run as quietly, as comfortably and as efficiently as possible for inhabitants. Meeting all these parameters for such an unusual project was challenging to say the least. The more air you push through a duct the more turbulence is created, the louder the air sounds and the harder the fan has to work to push it through. This excess noise can be disruptive and annoying for occupants. To mitigate these noise issues Enhabit upsized the ComfoTube ducting from 75mm to 90mm diameter, so it could push through more air at lower air speeds. A radial design with two central manifolds was chosen so that individual sound attenuators to each valve would not be necessary. The amount of background airflow needed to continuously clear the air of these harmful build-ups of VOCs meant that the number of valves would have to be doubled to each room on the houseboat. This halved the amount of air coming out of each valve, reducing the risk of the air feeling draughty as it flowed into the rooms. Excessively high or low Relative Humidity (RH) can cause discomfort and illness for occupants. Because so much air would be displaced regularly by the high flowrates, the risks of drying out the air in the houseboat and lowering the Relative Humidity (RH) of the air in the houseboat were increased. To mitigate this, the Zehnder Q600’s heat exchanger was removed in exchange for an enthalpy changer, which would recover moisture from the warm exhaust air and transmit it to the dry supply air in winter. This meant the MVHR system actually became an Energy Recovery Ventilation (ERV) system, and should maintain RH levels in the house nearer to the 40-60 per cent range that is comfortable and healthy. The large diameter and sheer amount of ComfoTube ducting required meant finding passages from the unit to each of the rooms in the houseboat was an added challenge. Fortunately, the manipulability of the ComfoTube and its structural integrity meant that Enhabit’s install team could successfully channel the ducting along the edges of the boat in hidden channels. It rose up to the next deck through dedicated risers that penetrated the the boat’s steel structure and into each of the rooms. Twenty separate ducts measuring a total of 250 metres were situated all around the houseboat in this way. The Q600 MVHR system is now up and running, with a total turnaround from Enhabit receiving the initial request from the client through to design, installation and commissioning of just eight weeks. The Q600 MVHR will provide the necessary ventilation to clear the houseboat of VOCs and the client was able to close their windows and doors and run their heating as they headed into the cold London winter. When the VOCs eventually break down completely the Q600 will be re-commissioned at lower flow rates more suitable for a houseboat.